Lynne Burkert, was shocked to receive a parking charge notice issued for exceeding the 90-minute stay at Lidl supermarket, Broadway Road, Evesham. She entered the car park on two occasions. She initially drove into the Lidl car park (which is managed by Euro Car Parks) at 10.57am. She stopped very briefly in a parking bay before she found her £1 coin was not there. She arrived back in the Lidl car park at about 12.30pm. She paid for her goods at 13.08pm, as shown by her register receipts.” She says she had been in the car park for 40 minutes when the warden, working for Euro Car Parks – the company which manages the parking scheme on behalf of Lidl – issued the ticket. Mrs Burkert said: “The attendant said he saw me pull in and leave and then saw me come back later. But he said the machine produces the ticket, although Ms Burkert said the pcn was handwritten. Euro Car Parks take the cake for the most confusing signs. In this sign, you can see in large font that the car park provides 30 minutes free parking. But in the small print it says “If your vehicle reamins in the car park for more than 20 minutes, you agree to pay a £70 parking change. When challenged, Euro Car Parks claimed the sign was not autorised by them, but was in fact used by an old customer of theirs. Euro Car Parks Limited has been forced to refund to drivers and cancel hundreds of parking tickets issued at a supermarket in Aberdeen. following a trading standards investigation. Euro Car Parks Limited issued 300 plus parking charge notices to drivers at the , Sainsburys Garthdee car park. But the local Council’s Trading Standards team found of the notices breached the terms and conditions at the site. 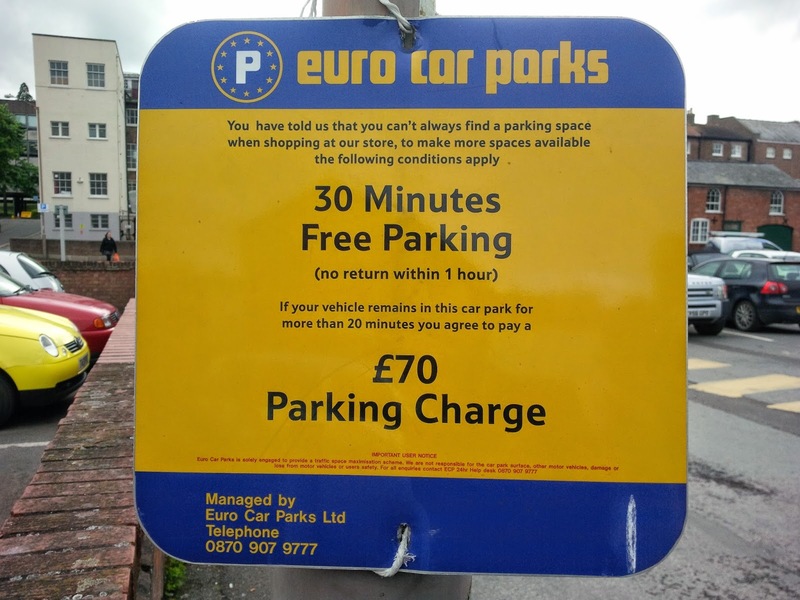 Euro Car Parks also admitted the notices made claims under the Protection of Freedoms Act 2012, even though that Act does not apply in Scotland. POFA 2012 allows Euro Car Parks and other parking companies to pursue the registered keeper of vehicles for unpaid parking fines. However, it only applies in England and Wales, not in Northen Ireland or Scotland. In Scotland, only the driver can be held liable for a parking charge notice. Euro Car Parks use Debt Recovery Plus for debt collection.